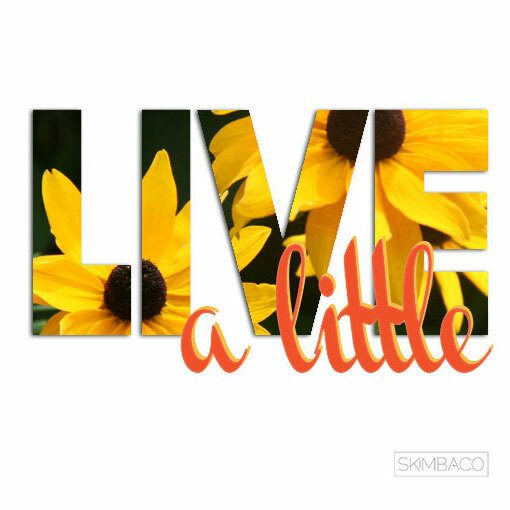 Join Us to Live a Little... In case you missed it, for a few weeks I will be linking up with an amazing group of women bloggers from the Skimbaco community. We will be offering up ideas on finding fulfillment in life right now through the little things to make the most out of each and every day. Have a blog? Love to have you link up and join us in this Live a Little blog hop!! Sometime this week, write a post about how you Live a Little then link up using the Linky at the end of this post and get the code yourself to put on your blog. I dated a guy in college who had all of these funny little sayings that he used to tell me all of the time. One of his sayings that I have pulled strength from frequently is, "I don't think about things I don't think about." As odd as it sounds, it actually is one of the best life lessons I have ever gotten. I used to think the simplicity of his message made it meaningless until I realize the simplicity of his message was its power. There really is no need or benefit to be gained from sitting around wasting one minute of your life contemplating things that you cannot change or things that make you unhappy. It comes down to the understanding that you have control over your thoughts and your resulting life. Not happy in a relationship? Stop sitting around wasting time thinking about why you are unhappy and how you can make it work and move on. Not happy with your body? Stop sitting around thinking about all of the different ways you can get fit and just do it already. Not living the life you want to live? Stop thinking about how awful your life is and make the changes necessary to make your life all you want it to be. It's time to live a little by taking control of your thoughts. Think of your thoughts as the fuel that powers your best life. If you are filling up on negativity and telling yourself you are powerless, you are just spinning your wheels. You will never get anywhere or be the person you want to become unless you take control of your contemplation.